We’ve all been there, finding ourselves working in an area without electricity with a truck full of equipment that needs electrical outlets. And it isn’t just the power tools, nowadays, we need to keep our cell phones charged and quite possibly a laptop or tablet on standby, to check plans and specifications as well as trying to avoid missing out on more business opportunities. 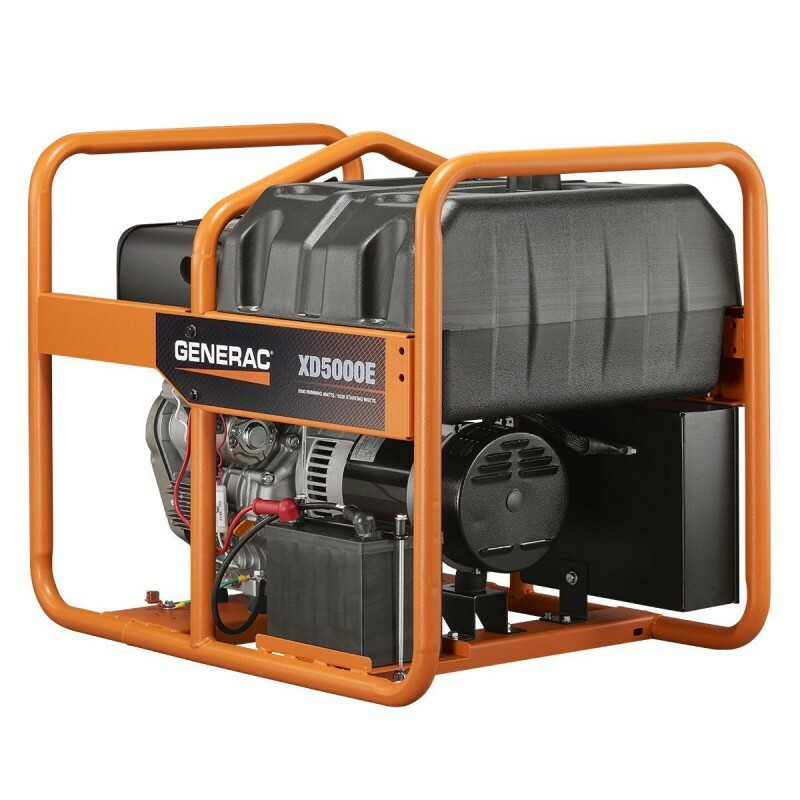 Generac’s new XD5000E 5000 watt portable diesel generator is their solution to reliable portable electricity. Buying a generator may be the obvious solution, but it is far from straightforward. You will need to consider not just the wattage you need, but also volts. Some heavy-duty electrical equipment like pumps etc. requires a 240-volt supply; a generator that can only supply 120 volts may not be much help. What fuel would be safest and easiest to use: propane, gasoline or diesel? How portable does it need to be, do you need to move it around a large jobsite, or can it be set up in a single location until the job is complete? These are things to consider when looking for the best portable generator to suit your needs. Generac’s new XD5000E might just be the answer to our prayers! Based in Waukesha, WI, Generac Power Systems have been providing generators for theresidential, light commercial and industrial markets since 1959, winning awards for their products including a silver medal in the ‘Plant Engineering’ product of the year awards in 2010 and the ‘Good Housekeeping Seal’ for its Guardian series of domestic generators. 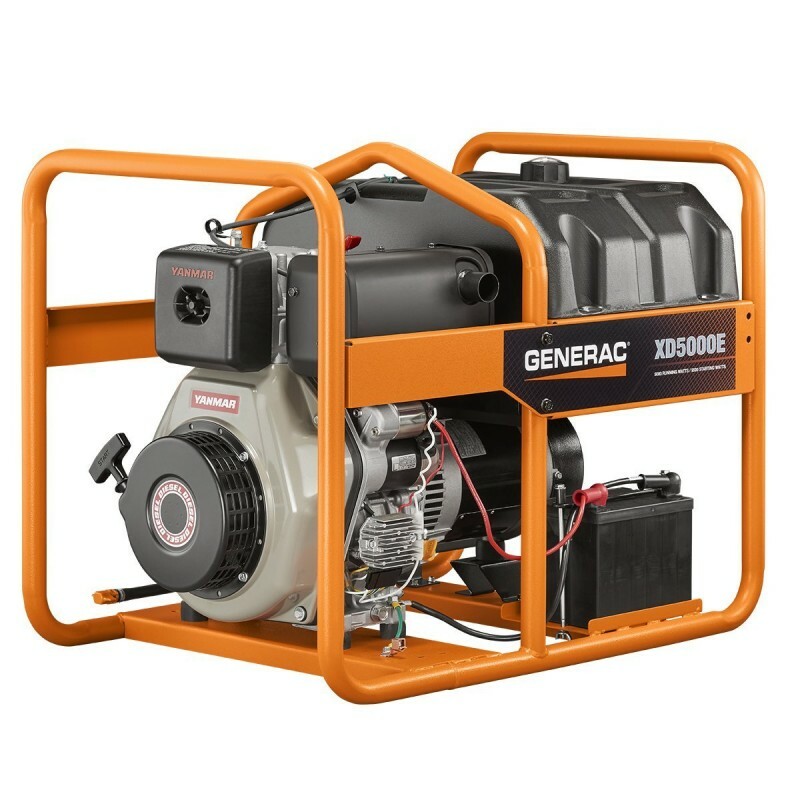 Generac units can produce anywhere from 800 watts to 9 megawatts and run on propane, gasoline, diesel or dual-fuel combinations. The new Generac XD5000E generator bundles all that experience and expertise up in a compact and practical unit designed specifically for professionals and contractors. With safe and ultra-reliable diesel power, the XD5000E will provide up to 32 hours of run-time from its integral 12 gallon fuel tank. 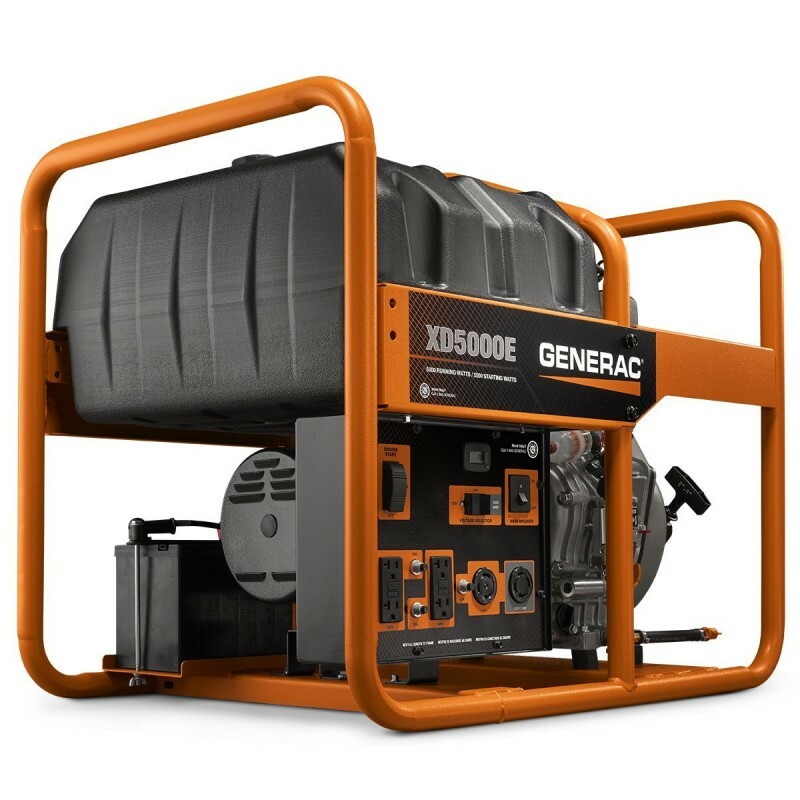 A durable 1 ¼” steel cradle protects the unit from all the bumps and knocks that inevitably occur in construction or other work sites, while the XD5000E incorporates Generac’s patented TruePower TM technology, ensuring that the electricity supply is generated with low total harmonic distortion for smooth, clean and dependable operation of everything from the most delicate electronics to the heaviest duty arc-welder. For professionals, diesel generators offer the ideal solution, providing unparalleled efficiency and reliability compared to gasoline-powered units. With fewer moving parts, diesel engines tend to last twice as long as gasoline (or propane) powered engines if properly maintained and serviced. The XD5000E comes with an hour-meter to track maintenance intervals for you and a low-oil shutdown feature will automatically turn the generator off if the oil level falls too low. Diesel fuel is safer to store and transport, and produces less dangerous fumes. The Tier IV-compliant Yanmar engine in the XD5000E meets all EPA and CARB requirements. The engine produces minimal exhaust fumes, and as with all diesels, low carbon monoxide emissions make it much safer to use in confined spaces. Weighing in at just 247lbs (112 kg) the XD5000E is easily moved, helped by an integral lifting eye including in the cradle (which can also be used to secure the unit if it needs to be left unattended on site). A separate portability kit (wheels and handle) allows even more mobility if needed. Easy and hassle-free start-up is achieved with a single-touch electric starter while a variety of outlets are provided to meet all your power requirements. 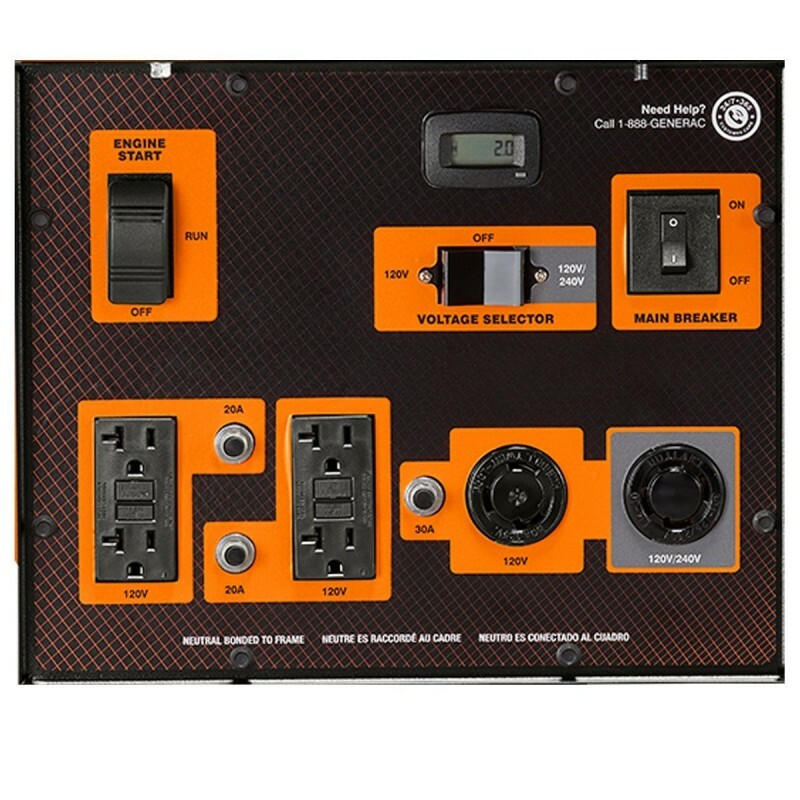 The XD5000E comes with four 20-amp GFCI outlets, a 30-amp TwistLock outlet and a 20-amp TwistLock outlet that can be set for either 120 or 240 volts. The Generac XD5000E Diesel Generator is expected to retail for $3,699.